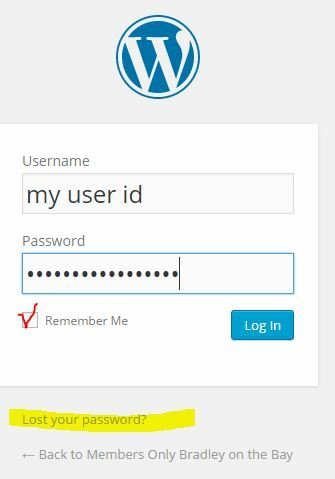 WordPress has forced all website users to create STRONG PASSWORDS for security purposes. There is no way to turn this option off. If you are not using a public computer (wifi from Starbucks, etc.) we recommend you check the Remember Password box before you log in so you won’t have to type your password all the time. If you can’t log in after two attempts, please request a password reset. You can either accept the generated password, or create you own after deleting the suggested password by clicking on the Lost Your Password link. You may have to read the email in TEXT only format in order to view the link to reset your password. You can then drag-select the reset link, copy it (CTRL+C) and then paste it into your browser URL bar (CTRL+V). You can either accept the suggested password, drag-select it then copy and paste it somewhere (or write it down) so you don’t forget. OR your can create your own. Note: You can update your email address in your profile as well. 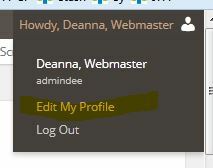 EDIT YOUR PROFILE – In the black bar, located in the upper right corner of the website — where it says, Howdy, Your User Name, with a little person icon — roll your mouse pointer over your userID name to see the drop-down menu. SCROLL TO THE BOTTOM OF THE WINDOW – Use the Page Down key, use the down pointing arrow key on the keyboard, or hold down the scroll bar and drag it to the bottom of the page to ACCOUNT MANAGEMENT. CLICK ON THE GENERATE PASSWORD BUTTON – The password will be 20 characters. You can use this password or create your own. Delete the highlighted password and type a combination of Upper and Lowercase letters, numbers, and special characters. You cannot use any real words (in any language) in the letter portions of your password. CLICK THE UPDATE PROFILE BUTTON to save your new password.